New and Improved Tango Vest: The Tango II. Overall revamped sizing - three different sizes available, XS-M, L-3XL, and 4XL-5XL. Length was adjusted to allow the DUTY Belt to sit at the waist where it belongs. The back panels were adjusted on the XS-M to fit any size of the pod pouch, while the larger vest were adjusted to PERFECTLY fit two 3 pod or 3+4 pod holders on the back with space between them, so they are not crammed in like the previous version. Also, adjustable velcro shoulders to fit any body size comfortably. Overall revamped sizing so now we fit XS-M , L-3XL , 4x-5x. The overall length was adjusted to allow the DUTY belt to sit at the waist where it belongs. The back panels on the L-5x sizes were adjusted to PERFECTLY fit two 3pod or 3+4 pod holders on the back with space between them. Adjustable padded shoulders to increase comfort under heavy load outs. D-rings for quick one point sling mounting. New front three buckle adjustable closure for increased flexibility. Full Molle webbing to maximize mounting options for all pouches. 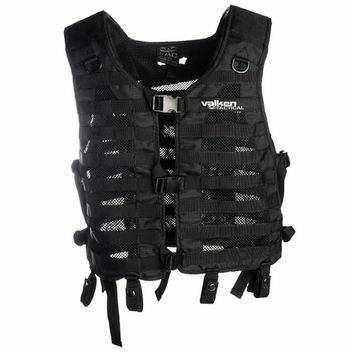 Question about "Valken V-TAC Tango II Vest Tactical"